Polls Close August 28th 2018, 9pm ET - Heat's 18th Birthday! 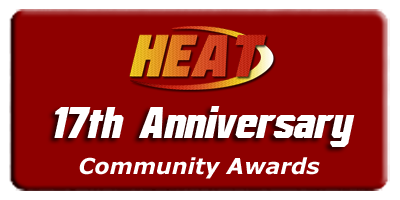 Below is the list of Group and Categories for the 17th Anniversary Heat Community Awards. Qualifications were developed and approved by HeatFinder Staff and Contributors based on readily available data. Data for performance group qualifications was provided by the Community Stats available at HeatFinder.net using 2017 stats. Data for support group qualifications was compiled by HeatFinder Staff based on activity from August 29th 2016 through all of 2017. These awards are for the enjoyment of our community and as a thank you to our great community members! There are currently 4 users and 11 guests online. We have a total of 13404 posts in 3396 topics within 22 forums.